Vero Software, a world leader in CAD CAM software with a proven track record of reliable product delivery, has released an update (SU01) to Edgecam 2018 R1. This release includes updates of relevance to manufacturers, new capabilities and/or bug fixes that improve the base release. ECAM-28443 Profiling Helical - gouges part with Compensation as "Wall is not vertical - cannot generate exact helices"
ECAM-35492 Profiling Helical - first pass creates incomplete arc and gouges model. About Vero Edgecam 2018 R1. Vero Software releases Edgecam 2018 R1, which includes updates of relevance to manufacturers. When a user makes an edit to an existing command, Edgecam 2018 R1 will not automatically regenerate the remaining instructions. When editing a tool command, there will now be no regeneration if the alteration does not affect the corresponding cycles with aspects such as coolant or high-speed. Two new items of functionality in the Roughing Cycle reportedly provide time savings in the milling, turning and MTM environments. The Waveform Roughing Strategy now gives users the ability to determine the radius size when using the helical approach option, by simply entering maximum and minimum values, which will aid the tool's entry into the component. Edgecam 2018 R1 provides support for Deep Hole Drilling - also known as Gun Drilling. The new strategy empowers the user to control entry, exit and intermediate drilling conditions. The Profiling cycle used in both milling and turning, now has two new items of functionality. A Spring Cuts field has been added to the Multi Passes tab, which means tool deflection can be removed where necessary, by adding extra neutral passes, known as Spring Passes. This will be used typically when machining hard materials...repeating the profile pass can result in improved accuracy and surface finish. Support for JT Open files is incorporated for the first time. This is a lightweight 3D model format developed by Siemens PLM Software. An Editing Manual Milling function provides for editing a manually created milling feature, instead of having to recreate an entire feature when extra edges are required. In addition, the Move Point function within the Inspection module has two further options: 'Fixed Axis,' and 'Fixed On Surface,' giving the ability to align a measurement point along a fixed axis, or a solid face. And the Plane Feature command has been enhanced enabling users to choose to evaluate 'flatness' on more than four probe touches. Edgecam 2018 R1 continues the evolution of updating cycle dialogs with pictures and context-sensitive help, by updating the B-Axis Contouring Cycle, and 3- and 5- Axis cycles. Another new feature that delivers time savings is the Pass Boundary To Cycles function, in the Feature Properties window. An improved toolpath is generated when the user engagers Current Stock, and picks a solid feature. Rather than use the stock limits, which can sometimes lead to unwanted passes, the toolpath is now clipped back to the feature's natural boundary. Finally, additional functionality has been added to the B-Axis Contouring Cycle, which was introduced in the 2017 R2 edition. Maximum Angular Increment will improve the surface finish by refining the NC output, while machining complex turned profiles, according to the company. About Vero Software. Vero Software is a world leader in CAD CAM software with a proven track record of reliable product delivery. 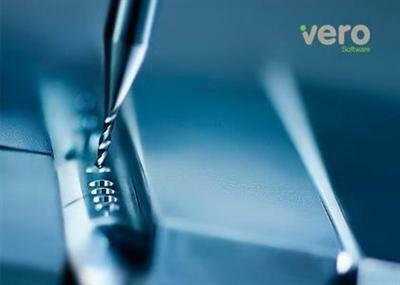 Vero develops and distributes software for aiding the design and manufacturing processes, providing solutions for the tooling, production engineering, sheet metal, metal fabrication, stone and woodworking industries. The company's world-renowned brands include Alphacam, Cabinet Vision, Edgecam, Machining STRATEGIST, PEPS, Radan, SMIRT, SURFCAM, VISI, and WorkNC, along with the production control MRP system Javelin. Despite the diversity of application, these solutions have one thing in common: they all address the rising challenges of achieving manufacturing efficiencies and bring huge value to the operations where they are deployed. Vero Edgecam 2018 R1 SU1 | 4.1 Gb download links are provided by Extabit Rapidshare Uploaded Rapidgator Netload Bitshare Freakshare Letitbit Dizzcloud and more.